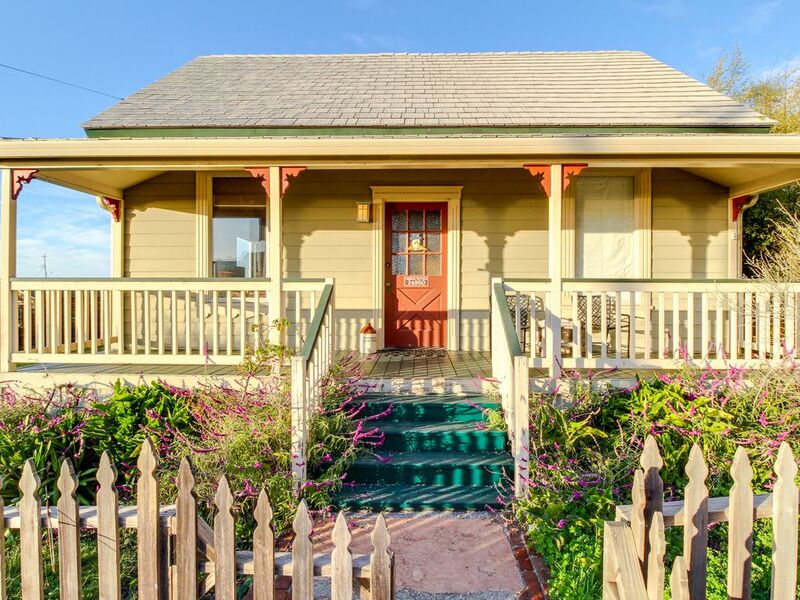 With a private deck just two blocks from a sandy ocean beach, this five-bedroom Westport vacation home will bring Victorian beauty and charm to your next Northern California Coast vacation. Beautifully situated just 16 miles north of Fort Bragg in the peaceful coastal town of Westport, this renovated oceanview home is also just 26 miles north of the artistic community of Mendocino. In search of a seaside retreat along California Highway One? The living space in this century-old home features plentiful seating, a gas fireplace, and sun-filled windows. There's also a flatscreen TV and a DVD player, but the absence of WiFi and cable service will encourage guests to pull out a board game or a novel instead. Admire the surrounding views as you cook in the full kitchen, complete with a dishwasher to handle the after-dinner clean-up. And you can catch up with your kids while enjoying breakfast, lunch, or dinner around the spacious dining table. On sunny summer days, you and your guests can take in sweeping vistas of the Pacific Ocean and the coastal hills from the expansive deck. There's an enclosed yard where the kids can play, as well as patio seating for sunset happy hours. As many as eight guests will sleep comfortably at this charming home. The two main floor bedrooms offer one full-size bed and a set of twins, while the three upstairs bedrooms have one queen bed, one full bed, and another set of twin beds. Guests will share one full bathroom and one half-bath. There is even a dollhouse and a few charming toys for the kids to play with. Spend your days in Westport hiking the headland trails, fishing, diving, or strolling along the ocean beach. But if you're looking to explore the many wonders of California Highway One, take a scenic drive south to Mendocino and beyond, admiring the Point Cabrillo Light Station and the Point Arena Lighthouse along the way. Experience the wild and rugged beauty of the Northern California Coast - book this historic home today! *Cell service is generally weak around Westport. Please plan accordingly, especially when arriving! *Beach access is via steep stairs that are not suitable for children or people with disabilities. Parking Notes: You may park in front of the home on Abalone Street. We had 4 teenage boys, our grand daughter, her husband, their two little ones and my husband and myself it there was plenty of room to sleep and hang out! Best weekend in a long time!!! Great place to stay with a large family. We had the best weekend ever. There were 10 of us and the house was perfect! The house was perfect for the seven members of my family for whom I rented it, three adults and four kids. The ocean views were great and we saw some spectacular sunsets from the very spacious deck off the kitchen. The kitchen itself was a real famiy kitchen with an oversized table and plenty of chairs. We found a game in the house that we all had a lot of fun playing as a family. Everyone enjoyed the frequent visits to the headlands and the beach, only a couple of minutes walk from the house and slept well on the comfortable beds. The kids brought a basketball and played on the court that is a 10 second walk from the house. The only down side was no internet access. It’s certainly wonderful to tune out, but the only thing that made the vacation possible for my son was his ability to stay in contact with his office. US Cellular is the only reliable provider in rural areas and I ended up purchasing a lot of data so that my phone could be used as a hotspot. Other than my thinking that the house should have WiFi I thought it was wonderful. Our family enjoyed this lovely beach house and the little town of Westport. The house is comfortable and has plenty of room for a large family with five bedrooms. No WiFi was wonderful because our children were not focused on their phones, but on playing together. If you want a quiet vacation away from crowds, then this is a perfect retreat. We had a wonderful time in this home! It was in such a beautiful location and the lack of WiFi and cell service made my kids interact with each other ☺️.